Features an in-built TFT colour display with wide viewing angle. YOKOGAWA'S new XL100 "Datum-Y" portable data station is a compact, rugged data logger designed for many maintenance and field service applications as well as for laboratory use. Incorporating either 8 or 16 universal inputs, the XL100 is capable of logging various signals including DCmV and volts, most common thermocouple types, RTDs, logic and pulse signals. With a measurement interval as fast as 100ms for 8 channels, the XL100 can easily capture fast changing signals and events. Other measurement intervals up to 1 hour make the XL100 suitable for very long term trending as well. Powered from ac power or an optional rechargeable battery, the unit can be left unattended logging to non-volatile memory or connected to a PC via the Ethernet interface that comes standard with the XL100 and the measured data automatically transmitted to a server on a network. The Ethernet interface can also be used to retrieve the measured data saved on the XL100 internal memory or an external storage medium into a server on a network. Data saving choices within the XL100 include internal memory, CF and SD cards and USB (copy function). If the data save operation is not carried out normally to the internal memory or external storage medium, the data is saved to the backup memory of the XL100, giving peace of mind data logging. This saved data can naturally also be copied to any external storage medium. An automatic start function can be performed by installing a CF card, SD or USB flash memory with a previously created setup file. This is convenient when users need frequently used setups for different applications. Alarm functions plus computation and various trigger types make the XL100 a very versatile logger - triggers can be set from high or low levels, windows (out or in), time or timer settings and alarms. Pre-trigger and delayed triggers are also included. Alarm data can be saved and logged and can be set from high or low levels, windows (out or in) and logic states. Statistical and differential computation, along with linear scaling functions are provided. 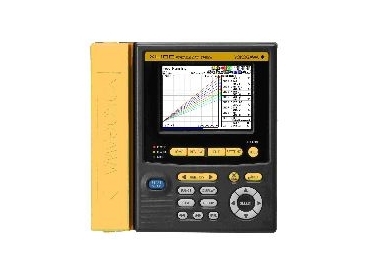 The in-built TFT colour display with wide viewing angle acts as a visual interface when configuring the XL100 from its front panel keys, and for viewing real time or reviewing saved data as waveforms, numeric data, bar graphs or event logs. Help screens are displayed on screen, if required, to reduce the need to refer to user manuals. Standard communications interfaces include Ethernet (10base-T and 100 base-T), USB and serial (RS232-C and RS-485). Functions include FTP server/client, web and email servers, plus Modbus master/slave functions are also supported. The web server allows monitoring and controlling of the XL100, providing an automatic PC screen update time of 2, 5, 10, 30 seconds or manually. In addition, a printer can also be connected to the RS-232C port. The XL100 is supplied with a detachable terminal block to make wiring up easier and a screwdriver is provided for this purpose. Other included items are a rubber boot for extra impact protection, a CD-ROM with manuals and standard software that allows the creation setting files, displays waveforms from saved data and converts from binary data to CSV data for processing with Microsoft Excel. Optional accessories include a lithium-ion rechargeable battery, carrying case, digital I/O cable, communications cables and printer.